I made some more macarons recently. In my efforts to try out a few more flavours, I decided to go for lemon basil macarons and cardamom vanilla macarons. 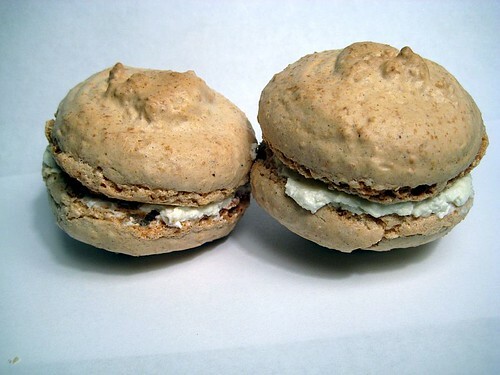 Both macarons were filled with a simple Swiss Meringue Buttercream. I flavoured the buttercream vanilla (for the cardamom vanilla, duh!) and lemon basil (for the lemon basil macarons, double duh). These were ABSOLUTELY DELICIOUS! Moist, slightly crunchy, and full of flavour. 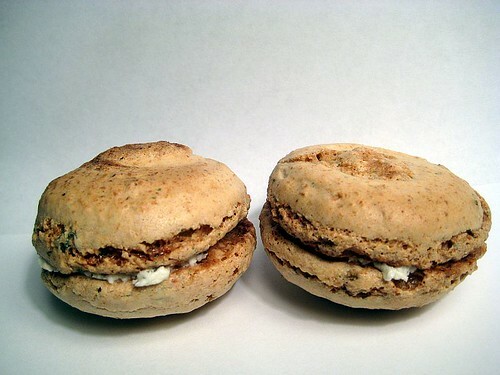 And I only added 1 teaspoon of ground cardamom to the macaron recipe. What a result! I could probably add a bit more for some extra oomph, but I’m happy with 1 teaspoon. These were just OK. I’m not a huge fan, really, but they’re good. I used a handful of fresh basil leaves for the meringue cookies, and also mixed some dried basil and fresh lemon juice into the buttercream. Unfortunately, the lemon juice overpowered the basil almost completely, so you can’t really discern the basil. Better luck next time. Also, you’ll note that both macarons are pretty much the same colour. I should probably revise that in the future to make it a bit more obvious which is which. I’ll work on it. After all, it’s all about the learning experience!